The summer of 2013, I had been a widow for a little over a year. I had made it through the first terrible year, but when I heard of the Granite Mountain hotshots perishing in a wildfire leaving behind many widows and small children, it brought back some emotions that I thought had been put behind me. Dec 2013- Last videos and radio contact. Of course, I relate closely to the families left behind. Here is an interview with the widows. It is still difficult for them. Hearing them even four years later is heartbreaking. During the summer of 2016 several movies were being made in my area. 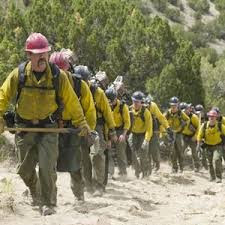 When I found out one was the story of those hotshots, I was very intrigued. I was so glad the story was going to be told. After having the privilege of being a very small part of the project, I have a lot of respect for the director and actors who seem to have felt a big responsibility to get this story told correctly!! I started seeing the call for extras on our local Facebook group and decided to check it out. It so happened that my friend Alison and her son were going to also be extras. My car is a 2013 model so it just made the cut to be able to be used in the film. Before I knew it, we were headed up to the local ski hill to be in an evacuation scene. There was a lot of sitting around waiting after we were checked in. While I was waiting, one of the women working with extras came up and asked if I would be willing to go back that Friday to be a court stenographer. I immediately agreed. We worked all day on that one evacuation scene and had a lot of fun being part of it all. The following pictures show how we spent the entire day. If this scene makes it in, we are all parked going down the mountain. We are upset and looking back at our burning homes. The Hotshots come walking through the middle of our cars. That Friday, I went back to film the court scene. They had me take several outfits that looked like a court stenographer. Alison previously worked in the probation aspect of criminal justice and helped me pick out the perfect outfit. When I got to wardrobe and showed them what I had, the women in charge said she had been watching old episodes of Murder She Wrote and had the perfect outfit for me. She had a completely different idea of what a court stenographer looks like than I did, but I certainly wasn't going to complain!! I ended up wearing a lavender colored double knit pantsuit!! Being used to the librarian stereotype, I realized that I just needed to go with the flow!! I sent this picture to my family and Alison. You can tell by the look on my face that I'm not happy about my wardrobe selection. We used a local courtroom for the scene. Not many people were involved so I was able to be up close to all that went on. The director, Joseph Kosinski, was very nice. This court scene involved Miles Teller. When they brought him in the first time, he glared at me. We were always warned not to talk to the stars so I tried not to go "I Love Lucy" on him, but he was glaring at me so terribly, I had to look at him. Then it hit me--- he was in character. He was playing the part of a teen who had gotten into trouble. I had been stared at like that numerous times by teenage boys at school. I was certainly used to that look by young men. He proved what a great actor he is to me just by that moment!! It seemed very real! I went back a few weeks later for the third scene. It was another evacuation scene. This time we were evacuating a neighborhood. Again, it was all day, but such a great experience. I randomly got put with a woman who I found out during the course of the day was good friends with my daughter's 3rd-grade teacher--- it is such a small world!! This particular scene has made the movie trailer. It is the scene with cars driving crazy and people running down a street. I was so close to the director and camera that I don't even know if I will make it into that scene. I had a great day with Annie! I was so shocked to find out she knew M's teacher!! This is how close I was to the director and the camera so I really don't think I'll make it into this scene. Alison and me after a long day of acting!! The guy in the background is a real actor from Los Angeles. He was filming another movie nearby and worked as an extra on Only The Brave on his days off. One very special aspect of being in this movie was what my daughter, M, got me for Christmas last year. We all exchanged gifts, and before I knew it, M was standing in front of me with a laptop showing me my page on the IMDb website. She created it for me and got it approved with the website. I will more than likely never have anything to add to my IMDb page, and they may take it down if I don't make it in the movie, but my 30 seconds of fame has sure been fun!! Being part of this movie was a great experience, but I know for so many it is so much more than a movie. It is a glimpse at a terrible time in their lives. It is the story of 19 young men losing their lives way too soon!! 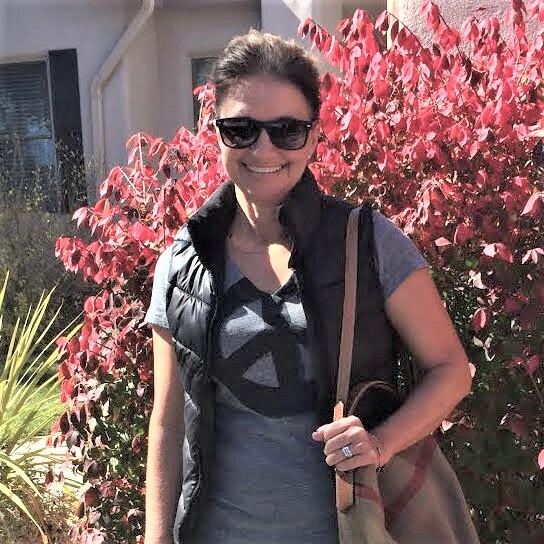 And since I now live in an area that has been ravaged by wildfires in the past, it is a story that will bring back horrific memories for many that live in New Mexico and other parts of the country. 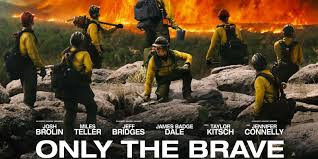 Only The Brave is extremely timely now with all the wildfires that have been burning over the past few months as well as the ones still burning. I'm so proud to have been a very small part of telling the story of true American heroes. I hope many people go see this movie, and that it is a great success! !